Luxury fashion house Maison Margiela introduces its new ‘Retro Fit’ sneakers in a low-cut structure. 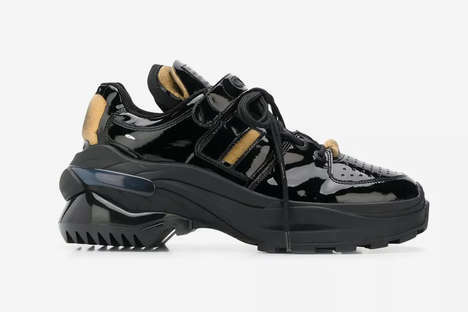 The sneakers are complete in an all-black colorway option and highlight the deconstructed details and bulky silhouette. The new version of the footwear model is more muted than the original, evoking a sense of sci-fi inspiration as well. The exaggerated uppers are constructed from laminated leather materials and it sits on top of an ultra-chunky midsole foundation. The glossy finish is complete with additional sponge inserts to give it a comfortable component and contrast in textile. There are also some golden accents on the tongue, sides, heel area, and on the lacing system. The Maison Margiela Retro Fit sneakers are now available for purchase online at Farfetch and additional retailers.